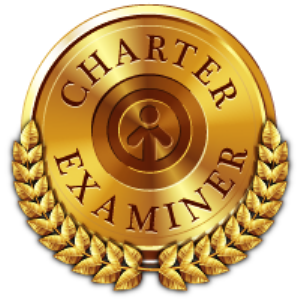 On Friday, February 7th, 2014 in Means Dry Lake area at Johnson Valley, California USA., a 194 mile off-road endurance race was held for the eighth year that has become known as the gold standard for an extreme test in unlimited off-road competition. The test, first held in 2007, is known as the Griffin King of the Hammers (KOH) and gets its name from the many rock strewn climbing tracks encountered throughout the course (Claw Hammer Trail, Jack Hammer Trail, Sledge Hammer Trail and the area includes Wrecking Ball Trail, Sun Bonnet Trail, and After Shock Trail to highlight a few features). 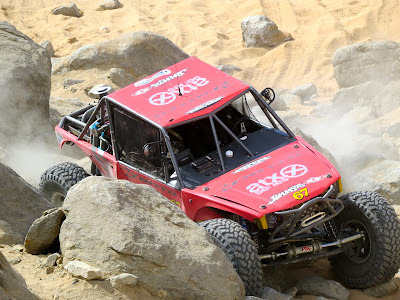 The KOH presents an intimidating blend of endurance desert racing that features rock crawling, sand tracks, hard-packed rock trails, near-vertical rock walls, and treacherous ledges. Nitto sponsored racer and 2010 KOH event winner, Loren Healy, of Farmington, N.M., took the top winning spot, driving the Unlimited class 4400 #67 Jimmy's 4x4 ATX Wheels/Nitto Tire Ultra4 buggy, finishing the 194 mile race with a total time of 8:03:25. 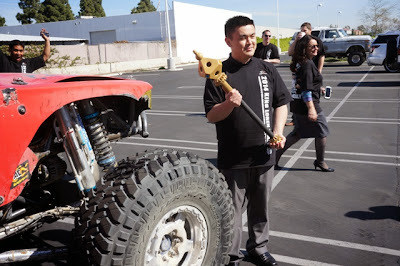 Healy felt, as communicated during a post race celebration on Thursday, Feb, 14 2014 held by Nitto Tire in Cypress, he was able to be successful again because of three main factors. The main, or #1 factor boiled down to the template philosophy that a steady and even pace with a buggy designed to take advantage of the driver's core strength of obstacle climbing was key. This starting point effected the outcome of the other two remaining factors which aided heavily to the reliability of the vehicle and allowed for an overall quickest conclusion to completing the 194 mile challenge. "I always enjoyed the adrenaline of going fast in the desert," says Loren Healy. "I wasn’t a desert racer to start. I was a recreational rock crawler. When they put them together in Ultra4, I had to try it." The #2 factor came in the choice of front axle the Ultra4 buggy was built upon. The controversy centers on the performance and reliability of an independent suspension/travel axle versus a solid straight/unitized travel axle. 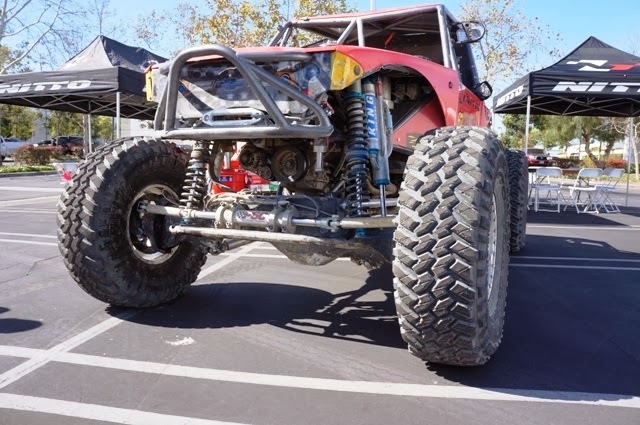 To take advantage of his recreational rock crawler strength and background, Loren Healy specified a straight axle for his Ultra4 design. "As the sport grows, the technology advances with it. We’re lucky in in that there are a lot of products on the market designed for desert racing vehicles that work well for us," said Healy. "The biggest game changer recently has been the introduction of independent front suspension because it’s very forgiving. A solid axle car is like a ‘70s or ‘80s pick-up truck can handle the horsepower, but when you hit a bump [on the flats], the whole vehicle reacts. There are a few vehicles built in 2014 that now incorporate an independent rear suspension [as well]. It looks interesting, but I want to wait and see whether it holds-up enough to be an advantage." Factor #3 came down to reliability. The mechanical will be what it is but the one area where time can be lost is in the choice of the tires. If the tread design is too 'blocky' and not staggered, it does not perform well going the 115 to 120 miles per hour speeds encountered in the flatter sandy tracks of the KOH course. 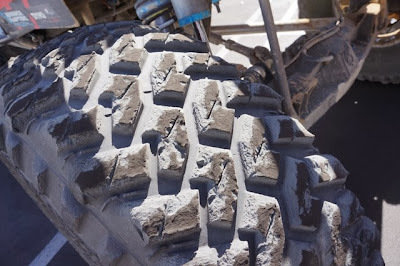 On the other hand, if the compound of the rubber itself is too hard, grip is not at its maximum and crawling over rock obstacles may have the tires slip and loose grip. Further, the tires need to be able to remain inflated ... a tire change on the track could take over ten minutes and this could mean the difference in finishing first, or something less than first. Loren Healy choose ATX wheels fitted with custom KOH race designed Nitto tires, designed by Senior Staff Engineer Alan Ngo. "Having the awesome ATX wheels and Nitto tires that we use, are a huge part of our success and how we race. It’s about the confidence to drive as hard as I can knowing that the wheels and tires can take it, without worrying about breaking a wheel or getting a flat tire. Every time you have to get out and change a tire, you’re losing positions to whoever is winning the race," he says. "We don’t even carry a spare tire. I don’t want the extra weight while we’re racing and I know they’re going to hold up." Said Nitto Tire Senior Staff Engineer Alan Ngo, "We modified the design of a standard Nitto 40x13.50R17 Trail Grappler Mud-Terrain tire by adding sidewall grip nobs and softening the compound to allow for a greater level of cohesion for crawling over rock obstacles. This win represents two full years without a tire failure with any of the racers we have sponsored in the King of the Hammers endurance event." 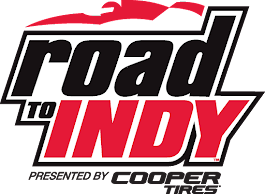 Of the 156 drivers who started the event, just 32 finished the race. Including race winner Loren Healy, Nitto had a total of five drivers complete the event. Finishing fifth was Derek West from Springfield, Mo., in the #4420 Jimmy's 4x4 Nitto Tire Ultra4 buggy. Right behind West was Rick Mooneyham of Lake Havasu City, Arizona, in the #554 Nitto Tire Trick Toys Fabrication Ultra4 buggy. Also finishing this grueling event were Nitto-sponsored drivers Ben Napier from Sydney, Australia, and Erik Miller of Cumberland, MD. Napier, driver of the #4461 BN Motorsports Ultra4 buggy finished in 16th place, while Miller, driving the #4421 Miller Motorsports Ultra4 buggy came home in 25th place, despite leading a portion of the event. For Loren Healy, driving the Unlimited class 4400 #67 Jimmy's 4x4 ATX Wheels/Nitto Tire Ultra4 buggy, winning the 2014 Griffin King of the Hammers presented by Nitto Tires off-road endurance event for the second time was as easy as 1-2-3! 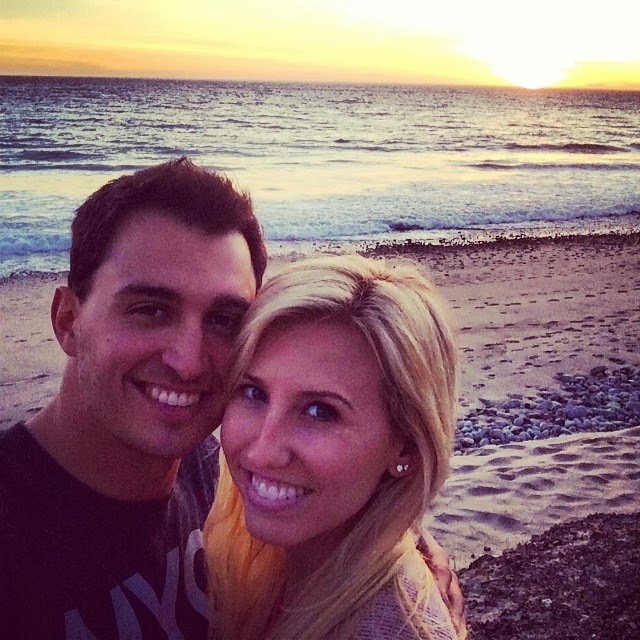 In honor of Valentine's Day, NHRA Funny Car driver Courtney Force answers trivia questions with her valentine, IndyCar driver Graham Rahal! 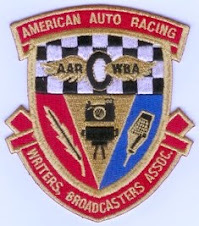 Many people who look in on all matter of motorsports generally have a little trouble getting their minds around American drag racing. 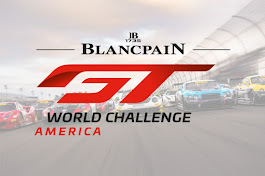 It is easy to transfer an experience of driving a car on a winding/curvy road and watch F1, IndyCar (road or street course), and Prototype/GT sportscar racing. What may be a bit harder to grasp for the casual motorsports observer are automobiles that develop 10,000 plus horsepower piloted by drivers who spend a total of five to six minutes of actual competition seat time during 24 events in the NHRA Mello Yello Drag Racing Series season. An 8 cylinder Top Fuel or Funny Car drag racing engine develops more horsepower in one cylinder than most of the exotic open wheel racing engines in Formula One or IndyCar do in total.That being said, visiting the season opening NHRA Mello Yello Drag Racing Series event at Auto Club Raceway dragstrip in Pomona, California this past weekend for the 54th annual Circle K NHRA Winternationals leaves one with an experience that gets better with time and ... age. 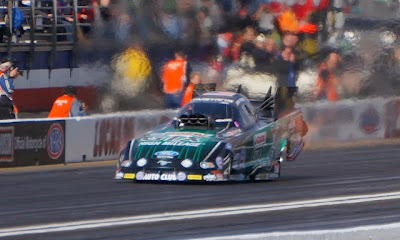 Defending NHRA Mello Yello Drag Racing Series Funny Car champion John Force set another new Nation Record en route to his record 139th-career NHRA victory in Sunday’s season-opening NHRA Winternationals at Auto Club Raceway at Pomona. Force outdistanced Matt Hagan in the final round with a record-beating run of 3.965 seconds at 323.58 mph, topping the National Record of 3.966 he himself set in qualifying on Friday as well as setting a new national speed record. Force came in to Sunday’s eliminations as the no. 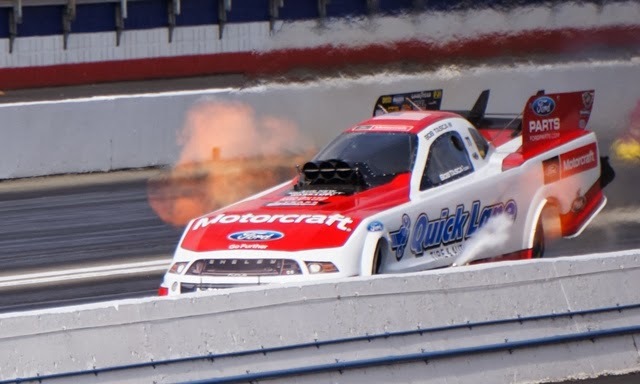 1 qualifier and got a first-round bye after Paul Lee broke in staging, then bested Tommy Johnson, Jr. and Bob Tasca to reach his eighth-consecutive final round. In the final, Hagan was into the tire shake right off the line and had to pedal it, giving Force an easy run to the finish, becoming just the third driver in Winternationals history to set a national record and take home the win, joining Don Prudhomme in 1976 and Kenny Bernstein 1987. The new national record also earned Force a 20-point bonus, giving him a 50-point edge over Hagan in the Funny Car standings. 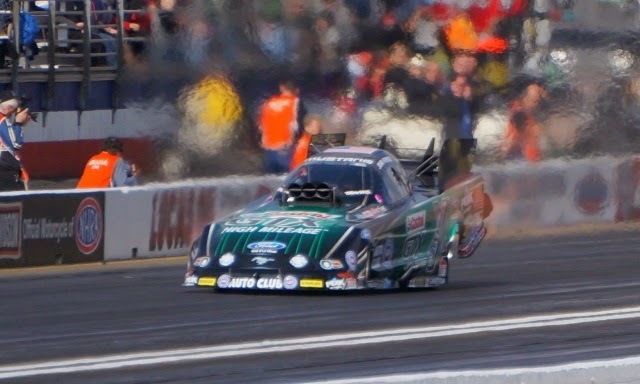 It was thought by most who follow the sport that the future for John Force Racing in 2014 was exclusively held in the prospects of the family members coming up through the ranks - Top Fuel racer Brittney Force and Funny Car racer Courtney Force. One might think that after setting nearly every record in NHRA funny car drag racing, 64-year-old John Force would have nothing left to prove. After this weekend's new sponsorship alliance announcement as a major associate sponsor in a multi-year agreement with Peak Antifreeze and BlueDEF Diesel Exhaust Fluid, Force is on a roll. He is working hard to impress new sponsors to replace the drop in income in 2015 when Castrol and Ford leave as the major sponsors of his enterprise. Further, after crew chief Austin Coil left John Force Racing, new crew chief Jimmy Prock is doing a good job as the #ProckRocket showed in its performance on the track in the #Winnats. 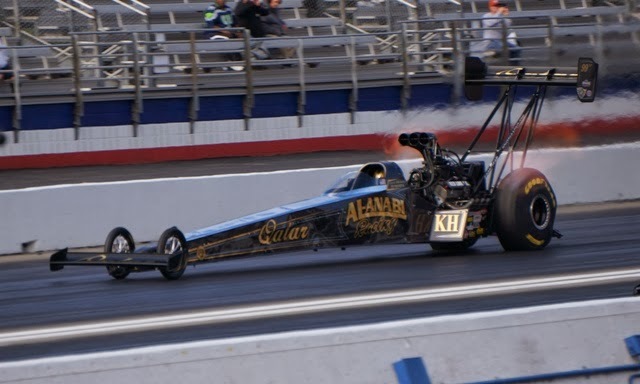 In the other racing category that features engines that develop 10,000 plus horsepower - Top Fuel, Al-Alabi Racing's owner and Quatar Sheik Kalid alBalooshi took down top qualifier Doug Kalitta in the final, running a 3.974 at 324.36 mph for his third-career NHRA victory after Kalitta went up in smoke right at the tree. Emirati drag racer Khalid Al Balooshi of Qatar Al-Anabi Racing Top Fuel Team won the first race of the NHRA Mello Yello Drag Racing season in California on Sunday. 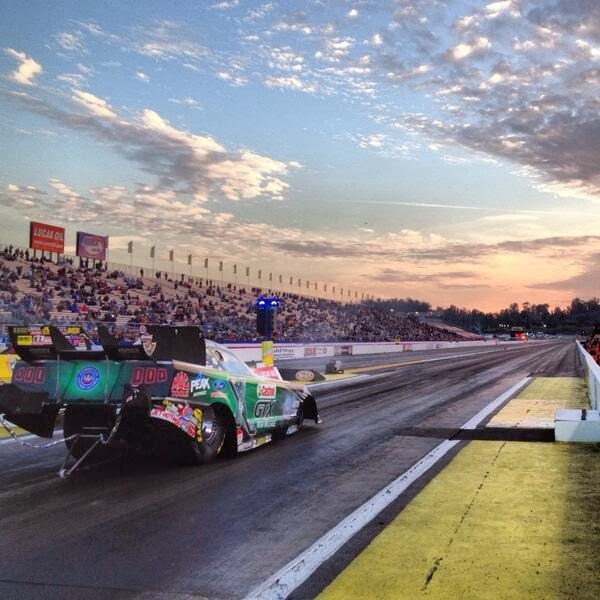 Al Balooshi entered the Cirlce K NHRA Winternationals in Pomona, California as the seventh-seeded driver. He beat seven-time world champion Tony Schumacher, Al-Anabi teammate Shawn Langdon, Steve Torrence in the semi-finals and No 1 seed Doug Kalitta in the final to take home the title. “I am so excited. There is nothing better than to leave the first race of the season with the first trophy,” Al Balooshi said in a press release. The victory was the third of Al Balooshi’s Top Fuel career. 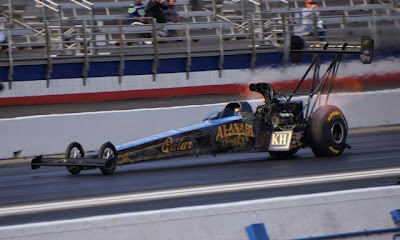 The Al-Anabi Top Fuel team have won the last three races at Pomona’s Auto Club Raceway, where Langdon was victorious twice last season. “The Al-Anabi car had a strong day today,” Al Balooshi said. “It’s a good win, especially when you have Tony Schumacher first round, Shawn Langdon second round, and ‘Steve-O’ (Steve Torrance), who’s been doing a good job. Doug’s (Kalitta) car was the best car all weekend, so it made it a very big day for us to take him down in the final and get the trophy. Khalid said in another post event interview that once he beat Schumacher in first round that he had a good car for the day, he felt his was the best, and it was ... Alan Johnson (Al-Anabi crew chief) is tough to beat, too. He's sharp and knows tons about car setups. What surprises most in this early season showing is how Tony Schumacher had lost his dominance in Top Fuel that he had achieved in the last couple seasons. To the casual observer - 16 time national champion Force came through as expected but Kalid alBalooshi of Al-Anabi was a big surprise - it can be said about the NHRA Mello Yello Drag Racing Series after round one in a 24 event series (to paraphrase the saying "nobody can be too pretty or too rich") ... it pays to be too old (64) or too rich (Dubai Sheik) in order to win at the #Winnats!